Relationships - the quality of peoples’ experience in relating to one another, including, the level of trust and respect people exhibit for each other and the organization. Process - how the work gets done, how it is designed and managed, and how it is measured and evaluated. Results - the accomplishment of the task, or achievement of the goal. The R-P-R Triangle (as they call it) in its ideal state, it is an equilateral with the process and relationships providing the foundation. Which makes sense -- because when it comes to measurable social, economic, or environmental change, without a strong foundation of relationships and process, it is very difficult to achieve results. Yet, I think I’d be hard-pressed to find a professional who hasn’t found themselves working in a team that was very focused on one or even two of the dimensions of success, while ignoring the third. And, I’ve found that the dimension that most often gets ignored is process. Throughout my career, I’ve collaborated with colleagues, board members, executives, grantees, and clients who have lamented process, saying there’s too much of it, it’s too slow, it’s too painful. And reflecting back on it recently, I was struck by something – process is an easy scapegoat when people don’t want to do the work. As opposed to the status quo, process is time consuming and it requires learning and changing. But I think there’s another reason that process gets a bad rap. It gets pigeon-holed as arduous and dull, and many people think it only describes a small set of ways of working. I love learning, sharing, and remixing processes and methodologies. And I am constantly surprised by how few changemakers have been exposed to the wide array of process possibilities, or thought creatively about how they might adapt and apply them. I understand why this is the case, our schooling, training, and work generally narrow the funnel of processes which we are exposed to very quickly. As a result, most of us don’t have a chance to learn about the approaches being used in different industries and sectors unless we intentionally seek them out. And for some reason, we often don’t think about what we experience – in our places of worship, when we engage with culture, or in our hobbies – as process (though I would advocate we should). 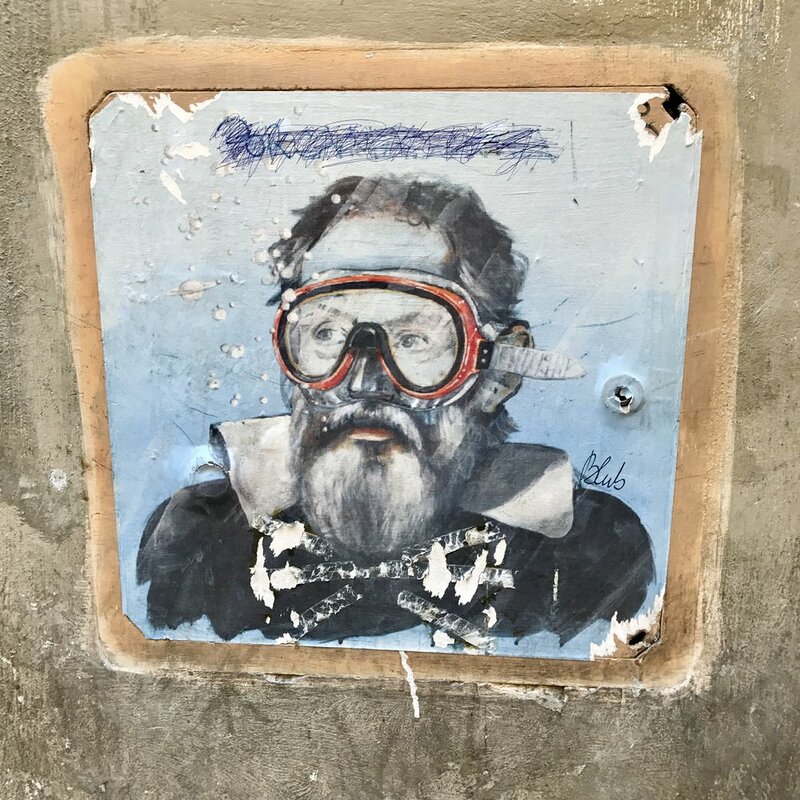 The Florence, Italy-based street artist Blub remixes famous art -- an example is this portrait of Galileo , As Blub said in a 2017 interview, "Renaissance art in Florence is still strong and hides today’s art that is alive and contemporary, so by using icons of the past with diving masks the theme presents a mix between the past and the contemporary world. There is no need to deny the past in order to look at the present, but at least acknowledge it." With the simple act of blue wash, bubbles, and a snorkling mask, Blub remixes old and new and allows us to see both! I believe that the more that I engage with the experiences and perspectives and stories of others, the better I will understand the world and the problems that I see in it. Similarly, the more I work to understand different processes and how to adapt them for different types of work, the more effective I’ll be at identifying the “right” process to design and adapt to achieve results. The analogy that comes to mind when I’m working with clients and collaborators to shape processes is that I’m a deejay. I have a collection of records (process) a room full of people (relationships), and I want is to get people dancing (results). My work is to figure out the songs that will get this group of people moving in this particular context. Sometimes that’s playing something new that they’re excited about, sometimes it’s an old track that they love to dance to, and sometimes that’s remixing a song that people know well so there is something they recognize and they are hearing something new. And my playlist is too far afield (say playing thrash metal to swing dancers) they won’t dance at all. Back in 2011, the Economy League of Greater Philadelphia used a well-known methodology – scenario planning – to try to describe four potential futures for its region’s economy. In addition to releasing a report, which described four possible futures identified through the process, they did something far more novel to make the scenarios come to life. The Economy League partnered with a local theater director and two actors to develop one-act vignettes to make the futures come to life. I attended that event nearly 7 years ago, and some of the details – like high speed rail taking an actor from Philadelphia to Atlanta in 2 hours – are still memorable. Talk about a novel process for making a seemingly theoretical process stick. In a different vein, the Innovation Central and City Alive initiatives in Albuquerque have incorporated strategies as varied as history lectures from local professors to help build a foundational knowledge base among its collaborators to an “annual report” developed and recorded as a poem. Need a third example (they do say that three makes a trend), my friend and colleague Dave Viotti’s firm Smallify, helps teams, organizations, and collaborations build their innovation capacity through highly interactive engagements. Among the processes he integrates into the work – his training in improv comedy which helps everyone in the room tap into their intuition and sense of fun. Know other examples of creative and effective processes? Share them in the comments below or using #optimisticanthro. Need help shaping your organization or collaboration's culture and knowledge to be a process deejay? Optimistic Anthropology can help. Drop us a line and say hello!